Subglacial ice segregation is a frost wedging process occurring beneath a glacier and driven by the mechanical energy made available when non-crystalline pore water migrates to and augments a mass of ice (ice segregation). Cold deglaciation describes a deglaciation process where a cold-based glacier undergoes downwasting to trivial thickness without ever transforming into a warm-based glacier. The processes described in this note relate only to the disruption of bedrock by ice. The subglacial ice segregation/cold deglaciation (SIS/CD) model can be used to interpret relict bedrock frost heave occurrences found on the Avalon Peninsula. This model, developed from observations and analysis of bedrock frost heave on the Avalon, explains bedrock frost heave, frost wedged hillsides (also called restricted plucking, see IF-05) and ice-generated fissures. The SIS/CD model was introduced April, 2017 and replaces models previously discussed in the Heart of Avalonia pages, such as subglacial bedrock frost heave by regelation, subaerial bedrock frost heave in a periglacial climate and hydraulic bedrock frost heave. The key elements of the SIS/CD model are listed below. 1) Frost wedging occurs beneath a cold-based glacier having sufficient thickness of ice cover to dampen out significant seasonal temperature fluctuations. The cold-based glacier is also thick enough to develop gravity-induced creep motion at a nontrivial rate, and thick enough to override topographic elevation variations in the tens of meters. 2) Frost wedging occurs while deglaciation is in progress and is a consequence of that deglaciation. Downwasting of cold-based ice cover then concludes with a trivial thickness of glacial ice remaining. Temperate conditions at the glacier base are not reached at any time during deglaciation (cold deglaciation) except possibly late enough in the deglaciation process that basal sliding cannot obliterate fragile disrupted-bedrock structures. 3) Deglaciation provides the pressure differentials needed to supply a continuous feed of water molecules to sites of bedrock disruption (provides an artesian aquifer). The preferred explanation for the pressurized bedrock aquifer is that the over-pressure reflects elastic rebound from the glacial hydrostatic loading imposed by an earlier, thicker accumulation of temperate glacial ice. It is also possible that sloping polythermal glaciers could generate trapped artesian aquifers below their cold-based tongues. 4) Describing the mechanism of water transport through bedrock remains a weak link in the SIS/CD model since the permeability and porosity characteristics of the various rock-types hosting ice-disrupted-bedrock features on the Avalon are not known. Most, if not all, of the Avalon bedrock showing major disruption by ice is strongly foliated, a result of regional metamorphism. The above illustration shows pressurized liquid water moving through joints (or fissures, faults, voids) at a depth where rock temperature is at the pressure melting point or higher. Since the ice-bedrock interface is necessarily at a temperature below the pressure melting point, water must approach the interface as premelted ice, moving through bedrock pores. Joints, widened to fissures by frost wedging, can serve as collectors for pore water and sites of initiation for ice segregation. Fissures can also transport ice toward the bedrock-glacier interface via ice-creep motion within the fissures. 5) Upon reaching the glacier base or sites of accumulated ice in bedrock voids, pore water exits bedrock pores and crystallizes (segregates). The heat of crystallization is transferred outward through potentially thick glacial ice by processes of conduction and/or advection. The occurrence of subglacial ice segregation requires that the overlying glacier be a cold-based glacier. The rate at which segregated ice can accumulate is limited by the rate at which the heat of crystallization can be removed. The process of crystallization of pore water converts heat to work and this work is manifested in shifted bedrock. It is likely that large ice-disrupted bedrock features developed slowly, perhaps over decades or centuries. 6) The continuous transfer of water molecules from bedrock pores to a cold glacier base results in non-tangential glacial ice flow (Note 6). The ice velocity vector at the bedrock-glacier interface is nonzero in this situation and ice flow in the proximity of the interface will reflect the sum of two orthogonal velocities, glacial creep velocity (tangential to rock surface) and segregated-ice evolution velocity (normal to rock surface). Segregated ice emerging at the ice-bedrock interface and moving into an overlying mass of glacial ice could form a slow-moving plume as illustrated in the above diagram. The shape of the plume would reflect the relative velocity patterns of ambient glacial-ice creep and intruding segregated ice. 7) Rock at the glacier-bedrock interface is stressed in tension when conditions favor segregation of pore water, a condition that is fundamental to the operation of the SIS/CD model. When tensile stress exceeds bedrock cohesion, failure will occur, fissures will open and bedrock disruption will result. Disrupted-bedrock fragments will shift in accordance with ice-pressure differences and will tend to track local ice creep. Complex patterns of bedrock shift can result from rock-rock interactions and from variable ice creep patterns occurring in ice moving near an irregular bedrock surface. The initiation of bedrock failure (equivalently the initiation of ice segregation) will be favored in zones of lowered relative glacial ice pressure, as would occur in the lee of obstructions (see diagram below). Glacier flow can then appear to cause bedrock disruption. 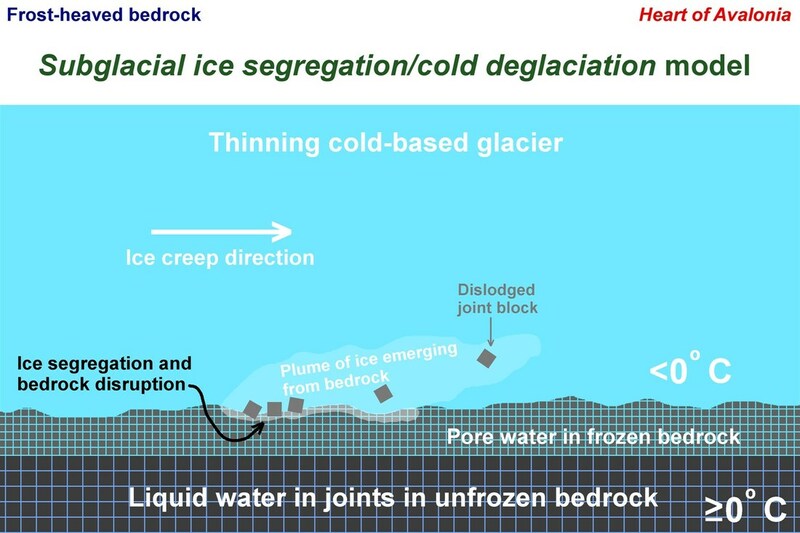 However in these circumstances the ice flow facilitates bedrock disruption (source of disruption is pressure internal to the bedrock, not transferred glacial ice pressure). Plucking via temperate glaciers has left numerous relict features on the Avalon Peninsula and distinguishing these temperate-origin plucked features from SIS/CD frost-wedged hillside features can be ambiguous. An absence of rock removal from a site of plucking provides the best evidence that the relict feature was formed during cold-based glaciation (hence falls under the SIS/CD model). 8) The final form of a relict disrupted-bedrock occurrence is the form that exists after glacial ice has departed and rock fragments have settled. Some fragments may have shifted short distances while remaining in close contact with stable bedrock or bedrock fragments. Settling would have little effect in this instance. Frost-heaved monoliths provide an example. Alternatively, fragments might be carried deep into glacial ice, remain suspended for years and eventually settle at a significantly displaced location or a seemingly random orientation. Disorganized frost-heaved mounds, down-slope features resembling relict rock glaciers, or scattered rock fragments could all result from larger ice-borne shifts of subglacial frost-wedged bedrock. 9) The cold deglaciation component of the SIS/CD model places constraints on the climate affecting the Avalon Peninsula during the time when ice-disrupted bedrock features were formed. Specifically, the climate might have been cold and dry over an extended period whereby cold-based glaciers could downwaste to trivial thickness without rebuilding. Alternatively, an episode of rapid climate warming might have depleted cold-based glaciers without providing sufficient time for the cold glacial base to reach the melting point. The Younger Dryas cold period likely played a key role in providing the circumstances under which cold deglaciation occurred on parts of the Avalon Peninsula. If so, the SIS/CD model and related observations of ice-disrupted bedrock could provide a new window into the puzzling climate fluctuations accompanying the Younger Dryas. 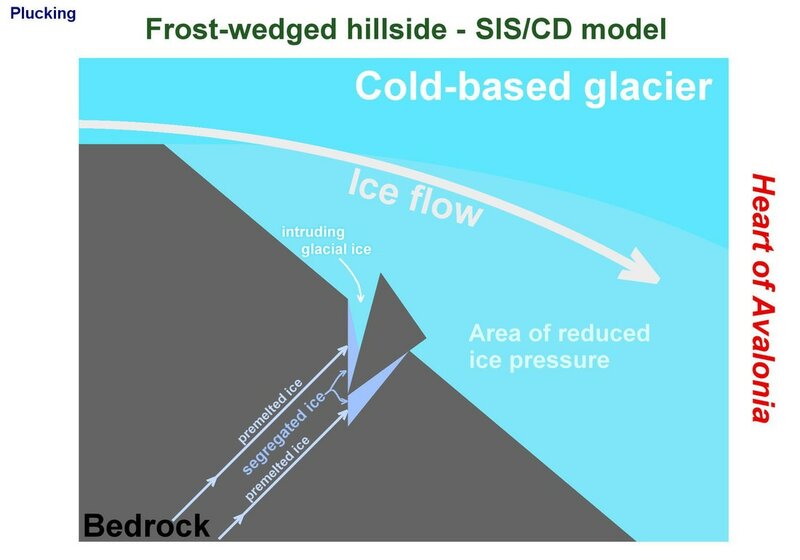 The above diagram shows the basic geometry underlying a frost-wedged hillside (restricted plucking) feature within the context of the SIS/CD model. Note how the displacement of the plucked block reflects a hybrid ice flow, with ice originating from bedrock and ambient glacial ice both playing a role. Frost-wedged hillsides are abundant in the main bedrock frost-heave areas on the Avalon Peninsula. They are often large in scale and their occurrence and severity is strongly indicative of glacier flow direction. However the fact that they are sometimes double-sided (occurring on both sides of a hill or ridge) warrants an explanation where transferred stress from glacial ice flow is not the root cause of the bedrock disruption. Rather, double-sided plucking favors a model like SIS/CD, where water pressure internal to the bedrock originates the rock displacement. Conclusion: A wide variety of observations of ice-disrupted bedrock on the Avalon Peninsula can be explained using the SIS/CD model. A significant number of observations cannot readily be explained without using key elements of the model. In summary, the SIS/CD model appears to be the simplest model that explains most observations made to date. Success of the model would provide potential new insights into climate fluctuations on the Avalon Peninsula during the Younger Dryas cold period.